I think this post is one of the most explaining and valuable one. Thanks Gregg! At last the day arrived. A non-significant day for many, a very significant one for me: vExpert 2016 nomination. It’s been in the night, in Italy was still dark, when I got the Tweet announcing the list , the blog advise to look for the name sing Ctrl+F was too easy and fast, I preferred scroll down… ’till I found my name. For me, a real emotion. Now, as Andrea states in his post, this is not an arriving point, but a starting one. A start for a greater involvement in social, forums, VMUG and wherever I could be useful. It’s a “heavy” reward, I can feel the weight of responsibility for all the people that rely on this title. So, now, well, it’s not (or nomore) time for self-congratulation. But time for a couple of beers, yes! Thank you VMware and to the whole community. 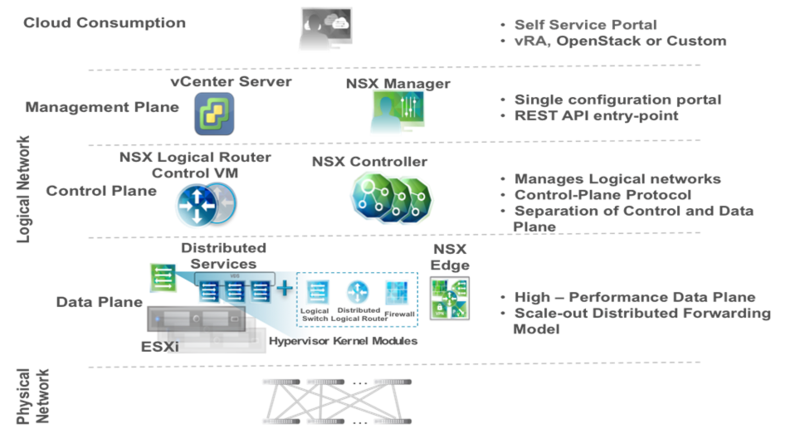 Following my last post about Vmware Valitaded Design, I’m happy to review a Nikhil Kelshikar‘s post in his blog allowing us to build a compliant design including NSX feature. I don’t want to overlap Nikhil’s post, so I’ll just write down my first impressions on this update. First of all it covers vSphere 6.0, and if you’re planning a new SDDC it’s mandatory. I think that a section of best practices will help all of them (us) involved in a practical SDDC design, allowing to adapt plans according to that rules. The theory explained in the previous issue is great, but a practical guide is even better. In few words, we can consider this update as a series of advises, a kind of validation for the theory in terms of routing and security, a strong help for architects and a good read for all of those that want to understand better how NSX works in a real environment, maybe even as a smart help for VCP-NV study. A new post about Tintri, again. But this is a news that I can’t ignore: its all-flash array line T5000 today has a new born. A little brother, T5040, up to 18TB and 1,500 VMs in a 2U box. More over, a new version of Tintri OS 4.1 supporting Xenserver hypervisor, among other new features. Last, “Tintri Analytics”: a predictive system at VM and application level. This new all-flash array at a street price of 125k$ opens this technology to more companies with lower budgets, and aimed to serve all the applications requiring heavy workloads like large persistent databases or persistent VDIs. The raw capacity is 5,76TB made by 24x240GB SSDs driven by a dual-controller. At the moment Tintri can offer 3 All-Flash array models (T5000 series) and 3 Hybrid models (T800 models). This new born device will be managed by the new OS 4.1, announced on December, in a webinar, from his co-founder and CTO Kieran Harty. 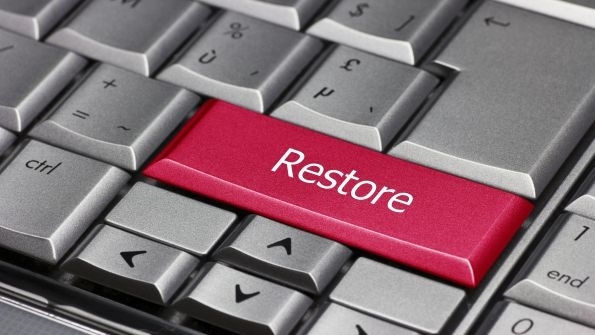 The most important feature is the support of another hypervisor: Xenserver, but even the File-level Restore, Shared Snapshot Deletion, Openstack/Cinder and more. Tintri Analytics go deep inside customer’s VMs and applications to shape the future needs in terms of space and performances – it will integrate the already complete Analytics. And you won’t run out of space since the analytics will predict you when and what to buy. Another like-to-be success for the Californian Company. Several times in my career I had to face a system issue that needed a “time machine” to solve. Usually a restore from backup was enough, whereas the backup was scheduled. In other situations, if and when the company I worked for could afford a DR traditional solution, I was lucky to rebuild the system from its mirror. Many times I had to rebuild the whole system, loosing data, usually not so critical to be backed up. Then virtualization came. Snapshots were a godsend, the main thing was to schedule them, no matter if they could have an impact on performances, the pros were far superior than cons. After some time, when virtualization became important and not only an exception, snapshots started to be annoying. In the last years, having a backup was no more enough for a critical system in production – too many hours could be lost. And snapshots weren’t anymore adequate because or they were catched frequently – but with performances impact – or occasionally, between a backup and another – which in this case lots of data could be lost. At 2012 VMworld I visited ZeRT0‘s booth. 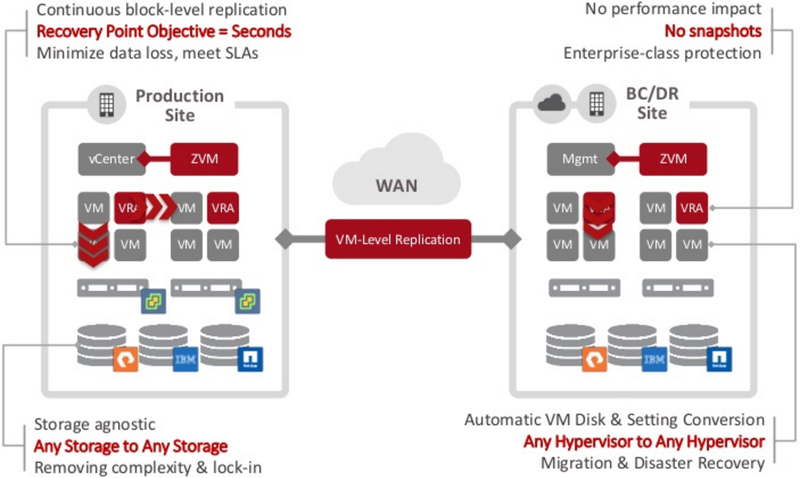 I was amazed by their solution, because it was almost syncronous, no snapshot based, no need of an alternative datacenter (either hot or warm) but, overall, hypervisor based. Through these years the application evolved ’till covering, today, even hypervisor-hybrid environment. So nomore just HW agnostic, but even Hypervisor agnostic. We latey upgraded to the last version, 4.0, it’s a major release. Before reviewing the last version, I’ve to say that the upgrade process took very few time and, overall, so few operations – it was a real easy walk even in a complex environment like ours. First of all, the architecture. We’ll talk of VRA (Virtual Replication Appliance), ZVM (Zert0 Virtual Manager), ZCM (Zert0 Cloud Manager) and VPG (Virtual Protection Group), just to name some acronyms. At the very low layer are the VRAs: little linux appliances rooted one for a hypervisor that take care of every single VM, all its pointers, all its network data, where its storage is, etc. Just upper lay the ZVM: it manages all the VRAs, transposes user’s setting via an intuitive (and nice) GUI, and connect to the recovery site pair ZVM. 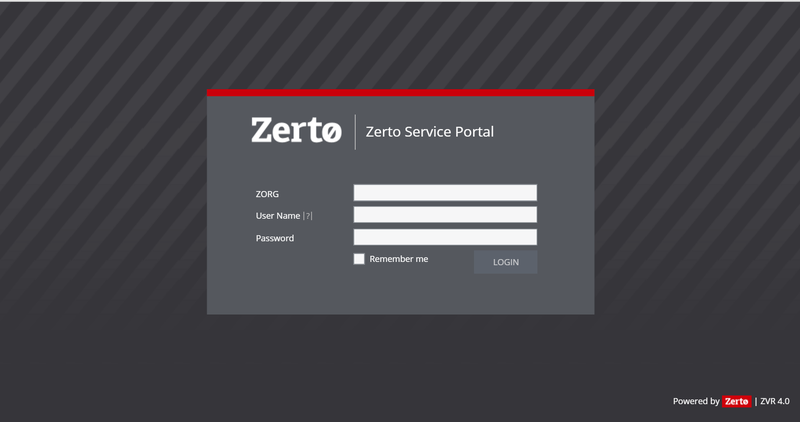 In the case of Cloud providers, or simply in environments where more than a ZVM is needed, you’ll have to install a ZCM: an orchestrator for the ZVMs, but, especially, a tool that offers cloud multitenancy, exposing a Self Service interface for the end user (ZSSP) and that deals with Connector installation – a proxy that acts as a ZVM pair for the customer, but that allows a complete privacy showing only its organization and separating all the other customers’ ones. The main difference I fond with the other solutions in the market was the RTO/RPO timing (very low to call it not only DR but BC too), and no usage of snapshots thanks to a journaling file where all the modifications written on a protected vDisk are reported to the replicated one and consolidated one by one after the chosen history time. Compared to a traditional solution, well, in this case the difference is even wider, from the possibility to recover a single VM and not all the storage volume, no need of mirrored DC, and the consequent cost. Now, what this solution misses from my point of view. From version 3.5 ZeRT0 implemented the extended recovery: it’s a middle way between DR and backup. I’d like to reduce the number of vendors for many reasons, so if backup could be covered by ZeRT0 I’ll be satisfied. But today we can’t use it for backup for 2 main reasons: it doesn’t dedupe, and restore from backup isn’t integrated in vCloud Director like, instead, recovery from DR is. So customer won’t be autonomous. From a CSP point of view, another missing service is the possibility to connect to customers residing on other CSP. It is a only-virtual solution. But this is not a limit for our needs. It does not replicate IDE disks – some virtual network devices are based on IDE disks – Watchguard is one of them. It doesn’t replicate vShield Edge rules, either org ones and vApp ones. The first case could be solved replicating by hand that rules before any disaster should occur, but the vApp ones cannot since the vApp is created only when a failover starts. My opinion, anyway, is that this is a real enterprise solution, where the benefits are far more than the disadvantages. A particular mention goes to the Support guys. They’re highly professional, responsibles at any hour of the day (and the night) and they won’t leave you, if a WebEx is needed, ’till the issue is solved, no sentences like “I’ll call you after my senior engineer will evaluate the issue”, that senior engineer will be ready online for your issue. Be aware, anyway, that ZeRT0 is a great tool, but it’s a TOOL, not a DR Plan. 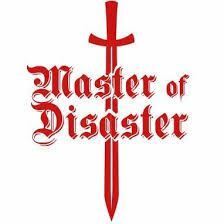 You need a plan to decide in an objective way when to declare a disaster and which are the procedures to be taken. Inside the plan you’ll insert ZeRT0 as part of it. Don’t make this mistake as some of our customers did. I’m sure I forgot some important feature, I hope ZeRT0 will forgive me. Below the comments section will welcome any suggestion and correction. We’re used to think at storage like some monolithic entities, black, inaccessible (only support can), and managed by strong specialists. The Tintri concept is somehow different. Let’s start saying that this is a virtual-only storage: don’t even think at it for physical purposes, it will lose all its charm. I’ll talk about the hybrid solution, T880 is the top device among Tintri’s hybrids. What’s different from others: the magic inside the (white – posh!) box. Actually, that’s simply a mix of SAS and SSD disks, so? So, the software is the difference. Some of you could say “Well, so why have a complete box instead of simply a software”. Yes, it makes sense. The reason why they decided to join HW and SW is “compliance”. Offering their own mix of HW with their SW let them say exactly which the performances will be, that there are no conflicts inside and, last but not least, a single point of support. Let’s have a look at the benefits. I think that the main benefit is performance. Anyone used to traditional storage will be amazed. Latencies and IOPS are something that traditional storage can’t afford. Setup – to set a box up in a rack will take no more than 30 minutes, its console configuration 5, its remote configuration 10. In less than 1 hour you’ll have your new datastore up&running. Dedup and compression – somehow variable between 1,5 and 2 in practical world, and it is performed in-line with no loss of performances. QoS – one of the reasons for the title. Tintri allows QoS per single VM, it means that if you need just a VM inside a group to be fast, is enough to work directly on it, should you decide that speed is no more necessary, again enough move the QoS crossbar. This also means having VIP customer and new marketing tools, if you’re a CSP like the company I work for. TGC, a.k.a. 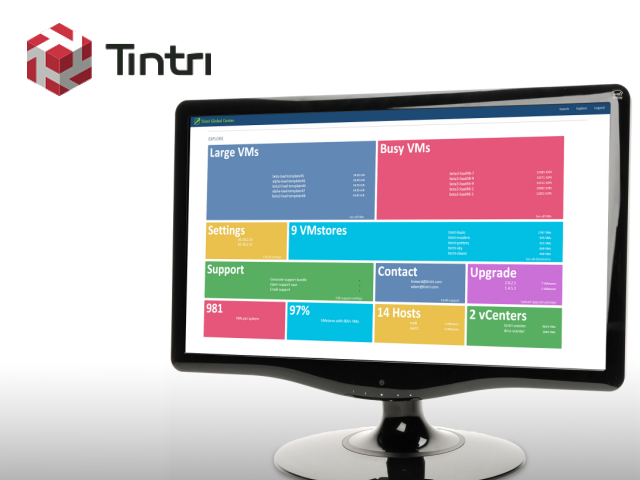 Tintri Global Centre, an orchestrator of all the features of all the VMstore installed. It’s not only a single panel to control the storage, but an instrument for better global analytics, an overview on all the VMs and global performances of the whole system. Storage management is unbelievably easier, all the time needed to manage LUNs and inflexible blocks can be allocated elsewhere. Footprint – a T880 fills 4U, it’s power consumption is about like an hairdryer, need for cooling more or less as a couple of blades. Now the unpopular items. If you have less than 80% virtualized, it’s not the best choice. If your budget is quite limited, you should look at traditional, even if slower, products. If you need performances, don’t have budget limits and your environment is pretty stable, look at all-flash arrays. Finally, I’d like to spend some words for the quality of support. During our P.O.C. (which I strongly advice to ask for) we had an issue with a disk, of course the system wasn’t new. I was impressed by the time elapsed from ticket being opened, to call and web-ex received, and solution. All in a flash, as the name “Tintri” in old Irish stands for. Good job guys, and “keep it simple”! This morning I had the pleasure to attend a general demo from Alberto Filisetti about what Nutanix offers in the hyperconvergence market. Nutanix based its datacenter on “building blocks”, each of them includes simply some servers and some storage, both standard, all managed by a “magic” software. Their IT team had the idea to export this model on the enterprise virtual market. This idea was so successful that they were able to gain about 400 million dollar in 4 round fundings, and they’re going to be public in short time. 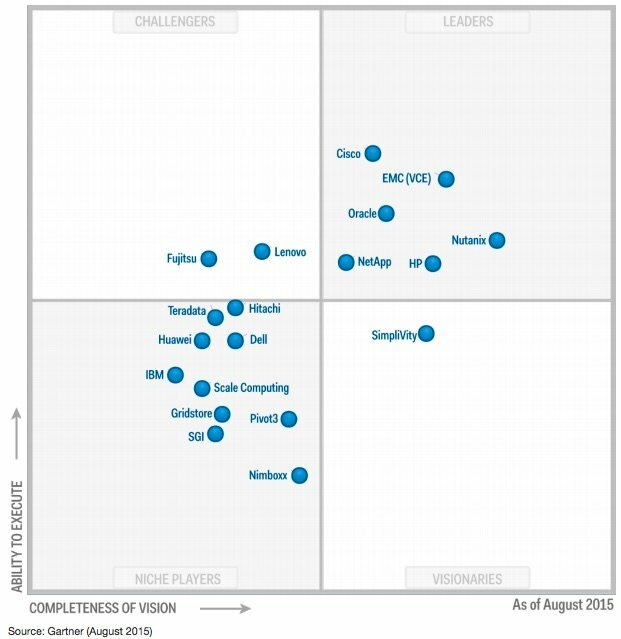 Today Nutanix holds more than 50% of hyperconverged market, inside Gartner magic quadrand its position is the leaders quadrant – high vision and high execute. The Nutanix “block” includes very standard computing hardware (Supermicro, Lenovo, Dell), managed by its real added value: the managing, orchestrator software, reachable even by API, and on it Nutanix assures reliability. Maybe the definition “orchestrator” is not completely suitable. Why uses standard hardware: for predictability of performances and to assure support by well-known vendors. 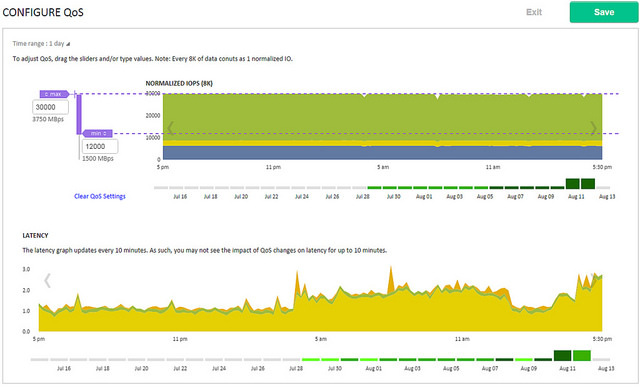 Which was the reason for this choise: latency is high when data reside on non-local storage. Implementing this solution, all the reads and writes happen locally. The base unit so, it’s called a 2-unit “Block”, containing 2 or 4 servers, or “nodes”. In this way they’re able to become up&running in just 20 minutes after mounting in the rack. As written above, inside a block you’ll find not only computational units, but even capacitivity power: disks, traditional and SSD aggregate only in one file system, connected by a 10Gbps ToR switch. On every node runs a Nutanix Controller VM (CVM) that is the real brain of the whole system. It resides on SSD and hosts the Nutanix software, serving all of the I/O operations for the hypervisor and all VMs running on that host. It’s hypervisor agnostic, his level is higher. Among all the hypervisors, KVM is one of the less used because of its hard manageablity. Nutanix has a solution in this case too. 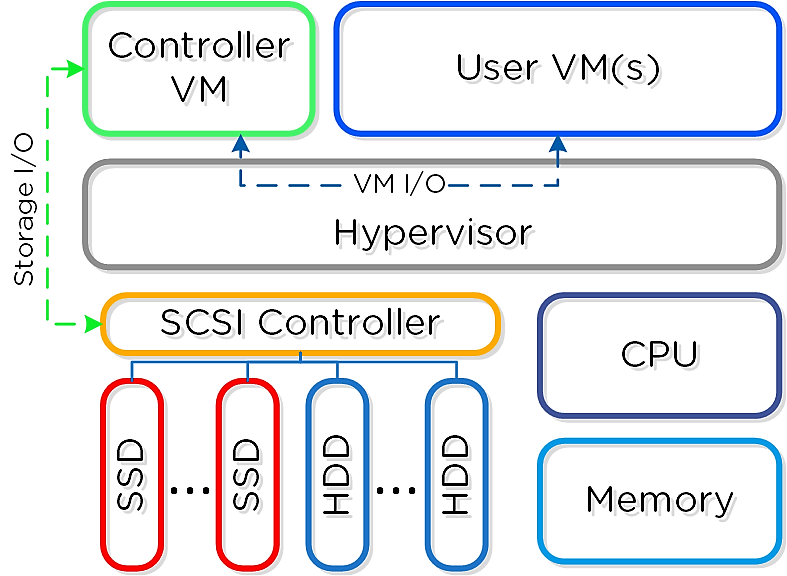 They developed a kind of hypervisor based on KVM, Acropolis, that simplify its management. Just a note: Acropolis is just an option, it isn’t mandatory for the system. 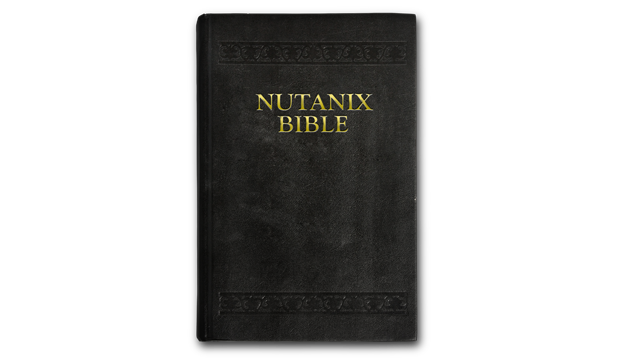 You’ll find a very good and updated resource for all Nutanix structure at Nutanix Bible. All the nodes are independent, from 3 to the infinite and could be added one at a time. Every node doesn’t add only computing (CPU and RAM) but also storage and IO since every of them brings a controller. Compared to an external storage so, these nodes have the advantage to grow in width, where the external ones have the same initial controllers as a funnel. Geographical and multi direction DR is also included, RPO minimum 1h, or BC, but in this case latency can’t be higher than 5ms, or using a VMware streched cluster. The main intention of Nutanix is to make the datacenter invisibile: before storage invisible and, at last, the whole virtualization and cloud invisible too. The first step, hiding storage, is reached thanks to a fabric (Lenovo) distributing the file system and protecting it. at the beginning it was mainly used in VDI solution because of low latencies, today VDI represents only 30% of business, even thanks to applications certifications (just a.e.SAP, Splunk, MS Exchange). Finally, virtualization and cloud invisibility: with Acropolis as a higher layer over hypervisors, and Prism, that manages all the hypervisors controllers, and even per-VM management, but in this case only for the servers running Acropolis. the wonder of this application is the one-click operation to add any eterogeneous hypervisor! The same platform is issued in a community edition, of course with no support. Now, to resume what’s inside the block: independent servers carrying and conected by 2/4 10Gb ports,redundancy ones and management ones. Adding a node means adding resources, computing and storage (3-direction growth). This growth could happen also with different hardware, in order to protect older investments. Every software upgrade (for bugs solving, for customer requests and suggestions, and because of greater performances (usually from 20 to 80% more) is performed by one click, no interruptions, no vMotions, because upgrades happen in a CVM at a time using redundanced automation. Or manually, uploading an image that is processed by VMware automation. Let’s have a look to the data flow, a. e. in a 3-nodes system: ESXi writes on traditional local disks and replicates to the neighboors 2 or 3 times according to the set policy, with a very low latency of nanoseconds. If and when a disk fails, metadata rbuild the data with no need of management, no need to wait for rebuild. Reads take place on SSD, in case of vMotion data are relocalized on the new server. The data locality allows IOPS of 15-20k. an high specialized and professional support, covering not only the software, but even the base hardware. Other hardware could coexist, in his case this hardware wn’t have all the Nutanix software optimization. Finally, I would underline once more that a cluster can be made with different hypervisors: one KVM, one ESXi, one Hyper-V, all controlled by Prism. I can’t wait to have a test unit to verify all this! November, 12th the most important VMware Italian users event was held in Milan. It’s been the third one, and the most successful of all 3. I care it especially because I had my first public speech in a so important occasion. But for sure it wasn’t me the best part. The VMUGIT Team did an awesome work. Mariano Maluf – VMUG International President, he’s the man pushing the buttons in the VMUG control room. I must be honest, I followed few of the sessions scheduled, since I was nervous about mine, but I’d like to report the feelings of the events. Attendees: all of the ones I talked to felt like attending a really important event. All of them excited for the international speakers. Most of them were there on their own, some taking an holiday from work. I believe they came back home satisfied. Sponsors: Since I was hosted by one of them, I can report directly that, at least for Tintri, they were inside a tech vault, talking to practical and well prepared professionals. So they expressed their best. Having a walk around for the other booths, anyway, I picked up more or less the same thoughts and behaviours – they knew that UserCon wasn’t the place for small talks and big numbers, but it was a good opportunity to introduce them to the tech heart of every company. Speakers: I personally feel dazzled when I consider Duncan Epping – see him talking with the same passion everytime is incredible, so maybe I can’t be unbiased. His session reminded me one of his best ones presented at last VMworld, however he can be considered as the natural father of VSAN. Andrea Siviero, another great professional in my mind, explained in a simply way how to design complex scenarios through VMware Validated Design. Me, I will not talk of me, just to say that my passion for Tintri solution is real and evincible by numbers. Unfortunately I wasn’t able to follow other sessions. Staff: I already knew Giuseppe Guglielmetti, a passionate professional, I already met Andrea Mauro, incredible blogger-reviewer-organizer-consultant-…superman! But it was the first time with the others. I had the confirmation on my beliefs – they are a strong team, and I feel proud to be a member! Good job guys, keep it up!